The Orbitrack app for iOS, an advanced reformulation of the older Satellite Safari app, features a greatly expanded database, as well as augmented-reality and virtual-reality modes with voice commands. 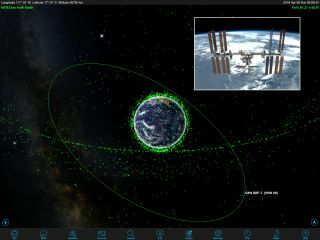 Using green dots to represent each satellite, the app's Orbit Mode, shown here, readily illustrates the difference between the low Earth orbit (LEO) satellite orbits, such as the International Space Station (inset), and the much more remote geosynchronous satellites (the curved chain of satellite symbols) that are employed for television broadcasts and other applications. When you select a single satellite, its name and orbit are drawn. If you spend time gazing at the stars on a clear night, you're guaranteed to see a satellite or two passing among them. But how do know whether that's a spent rocket booster, the Hubble Space Telescope or a crewed space station gliding silently overhead? And what was that momentary flash of light? Was it a meteor, or the glint from a shiny satellite? Iridium flares are very bright glints of sunlight off of the flat, reflecting sides of one of the satellites that constitute the Iridium pager and sat-phone networks. The flares occur before dawn and after dusk, when the satellite passing overhead is still illuminated by the sun, which is below the horizon for observers on the ground. The duration and brightness depend on the angles between the observer, the satellite and the sun. The better flares outshine everything but the moon and last about 5 seconds. Dedicated apps are an ideal way to find out when these flares will happen at your location. This series of panels illustrates the process of observing a satellite event in Orbitrack. From left to right: Open the Search menu, and choose a class of satellites. When you select the Iridium Flares class, a chronological list of upcoming events will be displayed. Tap the satellite name to open the information page, or tap the clock icon to see the event portrayed on the sky. In AR mode, holding your device up against the sky will let you pinpoint the location of the flare. Orbitrack's satellite database has doubled in size from its predecessor, Satellite Safari, adding new categories, such as military spacecraft. The app automatically adds new objects as they are launched and revises the data as orbits change over time. The satellites are organized logically into categories. Opening the Search menu brings up a well-organized list, starting with the special-interest satellites, such as those that will be visible that night, upcoming Iridium flares, newly launched satellites and bright satellites such as the International Space Station (ISS). The rest of the major classes are Weather & Earth Resources, Communication, Navigation, Scientific, and Miscellaneous satellites, and each is divided into subcategories. In each list, the satellites are listed in alphabetical order. Satellites that are above your horizon at the present time are highlighted with brighter text. Each entry has a link that will allow you to preview the sky during the pass or set an alert to remind you. (The Settings menu lets you sort the Search-menu results by pass time, which is highly recommended.) You can also find an individual satellite or family of satellites by entering all or a portion of the name into the search bar. Orbitrack can display satellites in four modes: Sky View, Orbit View, Satellite View and Ground View. Each of the modes is accessed using icons on the toolbar. Time flow controls, which operate the same way as in the SkySafari app series, allow for a lot of added functionality. If you are planning an observing session, you can preview the passes that will happen that night. Or, if someone tells you about a satellite pass they saw, you can enter the corresponding date, time and location into the app; swipe to bring the correct part of the sky into the display; and see which satellites were passing. By stepping time forward or backward, you can allow for a bit of uncertainty in the time it happened. Sky View is the fastest way to identify passing satellites. With the app's time set to Now, hold your device up to the sky in portrait mode to trigger Orbitrack's Augmented Reality feature. If your device has compass and gyro sensors, the app will display the part of the sky you are pointed at and the satellites currently passing through it. You can then tap a satellite's symbol to select it and then tap the Info icon to learn more about it. Another useful trick is to tilt the device downward to show the sky below the horizon. By panning around, you can see satellites that will be rising soon. Orbitrack's VR Mode is triggered when you tilt your device horizontally to landscape mode. The screen divides into twin binocular panels that will produce a 3D view when your device is mounted in a VR viewer. VR Mode supports both Sky View (top panel) and Satellite View (bottom panel), in which you can view modeled satellites from any angle. Orbitrack's Orbit View displays a zoomable, 3D-rendered model of Earth surrounded by green symbols for orbiting satellites. When a single satellite is selected, its orbit and label are drawn, too. By default, the display will be fairly cluttered. In the Settings menu, under Satellites Shown, you can decide which classes of satellites are displayed. As a fun exercise, enable just the geostationary satellites to see how their distant orbits contrast with low-Earth-orbit satellites such as the ISS and the Hubble Space Telescope. Satellite View is fun, too. Southern Stars has included 3D renderings of most major satellites. In this mode, you travel in space alongside the selected satellite. By swiping your finger, you can view the satellite from any angle and watch it transition from fully lit to shadowed as it orbits Earth. Launching VR mode allows you to fly around the satellite by moving your device while viewing it immersively. When you preview the future pass of a particular satellite, you can determine where in your sky the satellite will rise, culminate (reach its highest point) and set. That way, you can ensure that you will be standing where it will be visible. If you select the option to create an alert for a pass, the alert will appear on your device's lock screen. In the main Settings menu, you can adjust the amount of advanced warning time (the default is 1 minute) and cancel alerts. To see upcoming Iridium flares for your location listed in chronological order, open the Search menu and tap Iridium Flares. (Satellites that are currently above the horizon will appear in bright-white text.) Tap the satellite name to bring up the information screens for that satellite, and scroll down on the Data page to see the list of upcoming flares for that satellite. Better yet, tap the clock icon to preview the event in Sky View or to set an alert. The app will show the flare in progress against the sky, and the symbol's size will indicate how bright it will look. You can open the time controls and flow or step time forward or backward to preview or replay the flare. The Orbitrack Augmented Reality and Virtual Reality modes work for flares, too. The ISS Detector app for Android is an easy-to-use tool for learning where and when satellite passes and Iridium flares will occur over your location. On the Events page, each event is color coded by type, and icons indicate the quality of the event, all sorted by date. For a small extra charge, the app can show you additional satellites and even where to look for observable comets, such as this month's Comet 21P/Giacobini-Zinner, which is visible in binoculars from dark locations worldwide. ISS Detector for Android and iOS by RunaR is another highly recommended satellite app. The free version tracks the ISS and Iridium flares, and provides an option to purchase a suite for tracking additional satellites, planets and comets. The app's user interface is very easy to interpret. The main page lists upcoming events in top-down order, distinguishing Iridium flares, satellites and other objects' labels by color codes. For each pass, an "eye" icon is sized to represent the quality of the pass. The local time of the Iridium flare, or start and end of the satellite pass, as well as the angle above the horizon at which it will occur, completes the information provided. The app can link to your local weather forecast, grade the probability of the pass quality and show the weather as a symbol. Even the sunrise and sunset times are available at a glance. If you are only interested in certain types of events, filters can be applied to the Events page, and alerts can be enabled for only the types of events you want to observe. Within each object category, you can set limits on the minimum elevation (if your horizon is obstructed) and the minimum brightness, toggle all-day or night-only passes, and even set the quality threshold — controlling whether it shows all events or ones that are brighter and higher in the sky. You can manually refresh the orbital data anytime, and the time until the next event is indicated prominently. In the tablet version of ISS Detector, the Radar (left) and Details (right) panes are displayed together. This image shows the yellow dots that move on the compass and tilt meter as you orient your device. In the left pane, the tablet is shown tilted at the correct angle and aimed in the direction where the Iridium 55 satellite will flare. Simply raise your phone to eye level and sight along the device, and watch that patch of the sky when you hear the warning beeps. The right-hand portion of the display provides details about the time and position of the flare and the real-time location of the satellite over Earth. On the phone version of ISS Detector, selecting an event brings up a pair of tabs labeled Radar and Details. (These appear simultaneously on a tablet's larger display.) The Details pane shows the satellite event's numerical parameters, including the current satellite location on Earth and in the sky. Accompanying this is a map of Earth showing the orbit track and location. A double tap enlarges the map for pan, pinch and zoom exploring, and a tap on the Return button reverts to the data/map format. The Radar pane is extremely handy. It presents a dynamic compass and tilt indicator to allow you to align your device with the satellite in real time, indicating clearly where in the sky to look. For Iridium flares, a dashed arc on the compass indicates the satellite path, and a dot indicates the flare location. For satellite passes, a solid blue arc shows the track and the point of maximum height. During a live event, the compass needle follows the satellite, allowing you to track it by moving your device. In both cases, the moon and the planets are displayed to help orient you, and a tap toggles the labels on and off. A single tap toggles from compass mode to a whole-sky star map with the object track and direction nicely indicated. Another way to use this mode is to identify where in the sky to see the comets, if you've purchased that upgrade. Students and ham-radio operators on Earth have had an opportunity to speak to astronauts aboard the International Space Station. Here, retired Canadian astronaut Chris Hadfield, who commanded the space station, is seen participating in NASA's Amateur Radio on the International Space Station public outreach project. Satellites pass overhead during the daytime, too. From time to time, the astronauts aboard the International Space Station communicate with students, teachers and private citizens using a ham-radio transmitter. The program is called International Space Station Ham Radio, or Amateur Radio on the International Space Station (ARISS). More information is available on the ARISS web page. Because the ISS orbits Earth every 90 minutes, the sessions last only about 10 minutes and require extensive planning to make the most of the limited time. On a more casual basis, the astronauts can operate their radio in their spare time, speaking with amateur radio operators around the world. Good luck with your satellite-hunting pursuits! In future editions of Mobile Astronomy, we'll tell you how to use your favorite app to see some of late summer's best deep-sky objects, how we measure the distances to stars and how their gradual drift in position will one day change the shapes of our familiar constellations. In the meantime, keep looking up! Editor's note: Chris Vaughan is an astronomy public outreach and education specialist at AstroGeo, a member of the Royal Astronomical Society of Canada, and an operator of the historic 74-inch (1.88 meters) David Dunlap Observatory telescope. You can reach him via email, and follow him on Twitter @astrogeoguy, as well as on Facebook and Tumblr. This article was provided by Simulation Curriculum, the leader in space science curriculum solutions and the makers of the SkySafari app for Android and iOS. Follow SkySafari on Twitter @SkySafariAstro. Follow us @Spacedotcom, Facebook and Google+. Original article on Space.com.